Create a new slide with the Title and Content layout. Use one or two levels of bullets, but try to keep the list as short and concise as you can. Right-click anywhere in the list and choose Convert to SmartArt. A menu of SmartArt diagram types appears, as shown here. Select the SmartArt type you want to use. 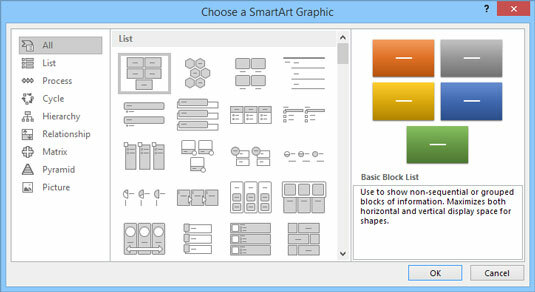 If the SmartArt type doesn’t appear in the menu, you can choose More SmartArt Graphics to display the Choose a SmartArt Graphic dialog box, as shown here. As you can see, this dialog box lets you choose from about a million different SmartArt diagram types. The Choose a SmartArt Graphic dialog box. Modify the diagram however you see fit. Well, you’re never really done. You can keep tweaking your diagram until the end of time to get it perfect. But at some point, you have to say, “Enough is enough,” and call it finished. PowerPoint offers eight basic categories of SmartArt diagrams; these diagram types are pictured and described here. List: Shows a simple list. Some of the list diagrams show information that doesn’t have any particular organization; others display information in a way that implies a sequential progression, such as steps in a task. Process: Shows a process in which steps flow in a sequential fashion. Cycle: Shows a process that repeats in a continuous cycle. Hierarchy: Shows hierarchical relationships, such as organization charts. Relationship: Shows how items are conceptually related to one another. Included in this group are various types of radial and Venn diagrams. Matrix: Shows four items arranged into quadrants. Pyramid: Shows how elements build upon one another to form a foundation. Picture: Shows information in a variety of different formats that incorporate picture objects into the chart design. If you prefer, you can create a SmartArt diagram by first inserting the SmartArt diagram from the Insert Ribbon tab. 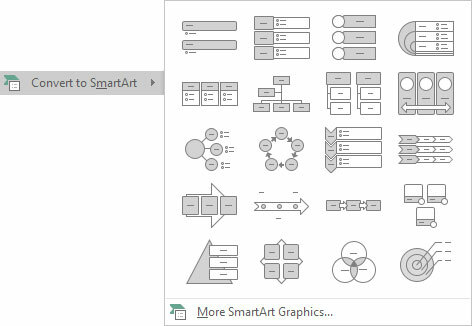 Then PowerPoint will prompt you to enter the text for each item in the SmartArt diagram.